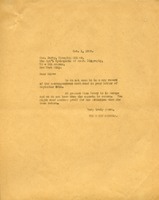 Mr. Derby writes to Miss Berry to ask her to fill out the questionnare enclosed so that The National Cyclopedia of American Biography can complete an entry on her and the work she has done. 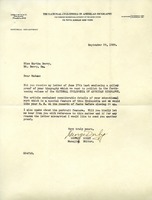 George Derby is asking Martha Berry to fill out a questionnaire so she could be included in an encyclopedia of Americans who have made a significant impact to her field in history. Included in the document are some of the questions of her background, impact, and family history.